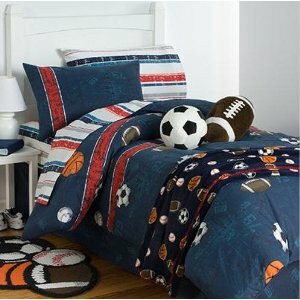 If you have a kid who is right into the big league and just loves their sport, then the Big League Boys Sports Comforter Set is going to suit their bedroom just fine. 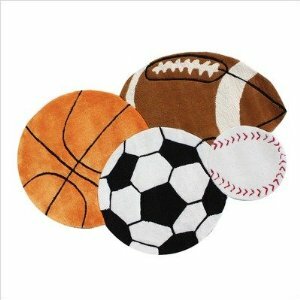 Just imagine the look on your young sports persons face when they see this great looking comforter featuring the four of the major sports. The face of the polycotton comforter is embellished with sports motifs featuring basketball, football, soccer and baseball and the co-ordinating pillow shams and sheets give this bed in a bag set a total look. This set is available in two sizes, a full sized 8 piece bed in a bag set and a twin sized 6 piece bed in a bag set. which features a brown football, an orange basketball, a black-and-white soccer ball and a white-and-red baseball. Where Can I Buy the Big League Sports Comforter Set and 4 Sports Rug?